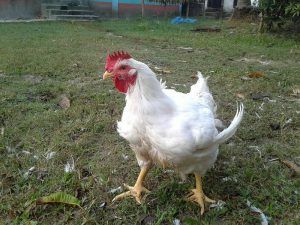 Types Of Chicken Feed – Learn Which Feeds Save You Money! 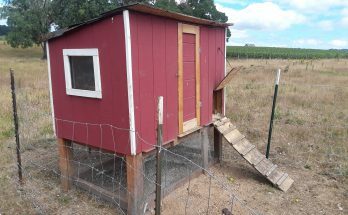 - FREE CHICKEN COOP PLANS! 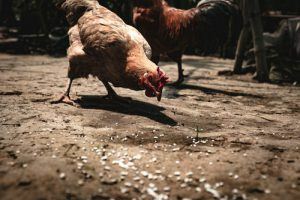 When it comes to feeding your chickens, there are a lot of different feeds to choose from – in fact it can be a bit overwhelming to figure out which types of chicken feed you should use for your flock. There can be different feeds for chicks (baby chickens), pullets (laying hens less than a year old), adult hens, and meat chickens. On top of that, feeds often come in whole, mashed, crumble, or pellet form, adding to the confusion…and then there’s organic vs non-organic. So we’ll break all of this down in a simpler way so you’ll know which type of feed you’ll need! Since we’ll be examining feed for chickens of various ages, stages, and utility, lets define a few terms in case you aren’t familiar. 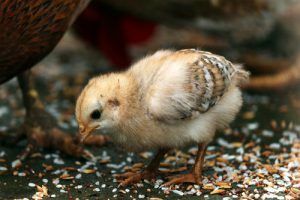 It’s not rocket science, but if you’re new to raising chickens and figuring out which type of feed to buy for them, it may be helpful information. What Is In Chicken Feed? I hadn’t really given this much thought until recently when one of my kids asked me. I assumed it was all high protein plant based stuff. After digging a bit I found that many feeds contain plant based AND animal based proteins. Popular grains used in chicken feed are the higher protein varieties like peas, rapeseed, lupins, and sunflower meal. Others are wheat, corn, and oats. Yup – chickens are omnivores. In the yard, you’ll see them eating bugs and insects in the grass etc. which also allots for some added protein. If you have enough space/grassy areas they can supplement quite nicely on these little critters! If you don’t like the thought of by-products in your chicken feed, you can consider buying organic chicken feed, which does not contain these by-products. You’ll pay a lot more for the organic feed but if it soothes your conscience, it may be worth it…that issue is up to you! 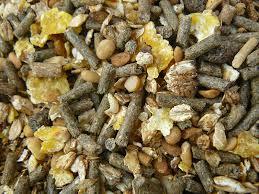 Chicken feeds come in different forms, either pellet, crumble, or mash, or a combination of pellets/grains. All the feeds mentioned next are complete feeds, containing the right amount of nutrients and vitamins. MASH : Mash is finely ground grains and mixed with protein supplements. Mash can be more affordable than pellets or crumble form because it’s not processed (or made into pellets). 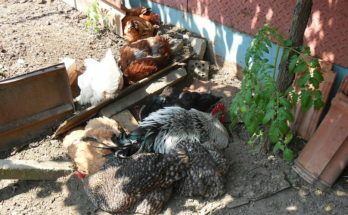 The chickens tend to spill more of it, leaving a lot of wasted feed (and money) on the ground. Can be fed to grown chickens as well but usually for chicks or Pullets (hens under one year old). Often has higher protein content, around 20%, which is higher than for laying hens which is around 16-17%. CRUMBLE: Crumble feed is essentially pellets crunched into crumble form, but not smashed so finely to be called mash. Chickens tend to like it the best in this form. Can be very messy and spill a lot of it on the ground – this has been my experience. Because of the spillage…it can cost a bit more than mash. Can be fed to Chicks, Pullets, or adult Chickens alike in this form. 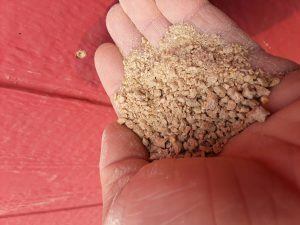 PELLET: Essentially the same feed as mash or crumble but made into pellet form. Less messy – the main reason I use it. Less spillage so your not losing as much money! Price is similar to Crumble feed. Is better suited for adult chickens (not chicks) because the size of the pellets are a bit big for chicks to swallow. PELLET/GRAIN MIX: Combines grains like wheat, corn, oats and micro pellets, which are high in protein and include vitamins and other minerals. The grains are either whole or cracked. Chickens generally prefer this mix over any of the other choices. Will cost more than mash, crumbles, or pellets. Some growers (and feed manufacturers) say that adding the grain offsets the finely tuned balance of the chicken feed and, therefore, egg production can suffer. (Photo by Prince Abid on Unsplash) Chick! For the youngsters, Mash or Crumble feeds are the most palatable. It’s often higher in protein – around 20%, a bit higher than in layer chicken feed, which is about 14-17%. Medicated – meaning they contain added medicine in the feed to prevent Coccidiosis, a disease found and spread from the chicken poop. 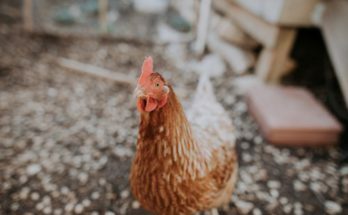 This feed is okay for your new hens, but there is still some debate as to whether or not some of the medication may transfer over into the eggs you’ll be eating later when your chicks become layers…I’ve used it in the past, but am more skeptical now. Non-Medicated – These feeds are recommended for Broilers, or chickens that will be used for meat consumption. Non medicated feed (standard feed) can be fed to hens as well but, obviously, won’t have the benefit of Coccidiosis prevention. The bags of feed are marked very well in the store to lessen any confusion. The feed you buy at your local farm stores or online is specially formulated for optimal egg production and is all you need for your egg layers. The amount of protein is around 14-17% for maximum egg production. 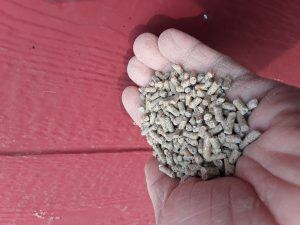 As stated before, it comes in many of the forms listed above – my personal favorite is buying it in pellet form so neither the feed or your money are lost in the bedding. Some chicken farmers like to add in some grit as well, which is ground up oyster shells. This helps with added calcium and aids in making the shells of the eggs a bit harder. 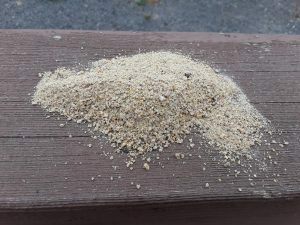 Grit is good for them and a few handfuls can be thrown on the ground or mixed into the feed. This is optional, but I add some grit to the mix if I notice the shells of the eggs are brittle and it seems to help. To read about some of the best egg laying chicken breeds, see this article! For your broilers, the feed manufacturers often have a sequential system set up. If starts with feeding one type of feed to Chicks when you first bring them home. Then after 2 – 3 weeks of age the next type of feed is fed (sometimes referred to as a Grower feed). Lastly, a Finish type feed is fed to them until the chickens are processed. These chickens grow fast! From the Chick stage to the when they are butchered is a whopping 4-8 weeks, give or take. The feed comes in the same forms of mash, crumbles, or pellets but the bag will clearly state the feed is for broiler chickens. The amount of protein and vitamins/minerals is formulated differently for each phase of growth the broilers are in. Again – the labels on the bags give a good run down of how long the feed is to be offered to your chickens. A general guideline to keep in mind is that it takes around 2 pounds of feed per 1 pound of weight gain per chicken. The ideal finish weight is 8-10 lbs, some growers preferring smaller than this. If you need a good but cheap way to feed your chickens, check out this idea! 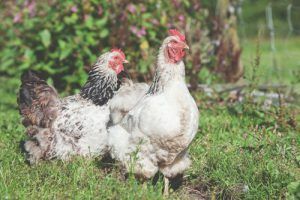 To begin this debate, remember that whether you feed organic or non-organic, YOU will be eating the eggs or meat your chickens provide…just food for thought:) There are pros and cons to each, which we’ll cover briefly here. You can feel good about eating the eggs and meat from your chickens knowing that what they ate was from a non GMO, healthy source. Much more affordable than Organic feed. Conventional feed provides adequate nutrition for your chickens at an affordable price. More accessible – can be found at farm stores and online. I’ll be transparent at this point…I use conventional feed and have used it for many years. I raise a lot of chickens and I occasionally sell eggs so it could be very expensive to sell eggs at around 5.00/dozen or more to get some of the money back used for buying organic feed. I have confidence that if there were any major problems with the feed we, the consumers, feed to our chickens we would have known it by now. Having said that – I try to strike a balance of providing at least some organic foods. We feed our chickens a lot organic vegetable scraps. And they are also free ranged, meaning they can run all over the pasture, finding bugs and seeds to eat. So in this way, I’m hoping to offset any potential problems using conventional feeds (if there are any). When I sell my eggs, we advertise them as FREE RANGE eggs, not Organic since we are not feeding them certified organic feed. If studies are ever done which report that feeding conventional chicken feed is bad for chickens and, in turn, the consumer – I’ll switch to Organic in a heartbeat. There is an interesting thread on the topic at BackYardChickens website. Take a look at it – there are chicken growers that are proponents of each side and the reviews are mixed. In fact, the research on the topic is also varied. In general – a lot of people try to buy organic feed if they can afford it or, if they can’t, they try to supplement conventional feeds with as many organic supplements (vegetable scraps etc.) as possible. Your local farm store is a great place to buy your feed. 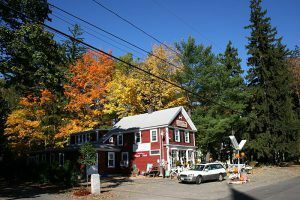 Many farm stores carry both conventional and organic feeds for any type of chicken you own. What’s nice about buying it at your local store is that you can also ask questions from the help there. They often have someone knowledgeable about raising chickens there, which I really appreciate. Buying chicken feed online is becoming more popular now, although shipping costs can be quite high. 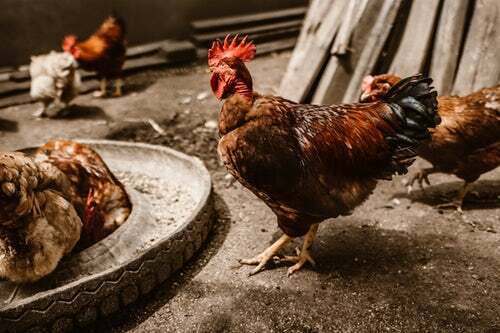 If you’re looking for Organic chicken feed in particular, buying it online can be a good option as there will be more varieties to choose from…if you’re okay paying more for shipping. You can also google search farm stores near you and make a few calls to see if they carry the types of chicken feed you’re looking for and how much it costs. This can save a lot of money driving around to see which store best suits your needs. We’ve spent a lot of time discussing what we CAN feed chickens, but it’s also good to know what NOT to feed them. There are a few items that can actually be harmful to your flock. Moldy Food – vegetable scraps are great! But if you see mold on them, it’s best not to feed them to your birds as mold can make them sick. Sweets – candy, chocolate, and the like are not good for them. Some of these sweet delights have caffeine in them as well, which can be detrimental to your chickens health. You go ahead and eat that chocolate instead:). Dried beans – these contain a chemical called phytohaemagglutinin, which is harmful for them! The cooked variety are fine so if you made bean soup for dinner, these are okay. 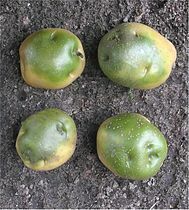 Green Potatoes – Green potatoes have Solanine in the peels, which can be deadly to your chickens. If you have seasoned spuds or mashed, you’re good to go! We hope you gleaned some useful nuggets (or pellets or crumbles) of good information here! Raising chickens really is a blast and part of the fun is finding the right feed. I hope you are now armed with the right information to pick the perfect feed for your flock. Please feel free to leave a comment below if you have any feeds that work for you, or if you have any insights into anything covered here. Thanks for stopping by! Previous Article Deep Litter Method For Chickens – What’s All The Stink About? Hi I like your site. It did have a lot if information about feeding chickens that I had wondered about. I like the explanation about the different kinds of feed; how and when to use them. It made sense to me. I would like to utilize all of this information but we won’t be getting chickens soon. I did like the variety of information on your site. It’s obviously something you know a lot about. I wish you continued luck. Thanks Theresa! I’m glad you found some useful information here and come back anytime. 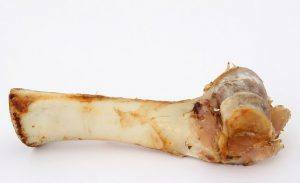 I basically only eat white meat, so this is a very interesting article for me personally. My grandfather used to keep bantams which make it even more interesting! I knew chickens were omnivores, but not cannibals! I suppose as the consumer we really don’t follow the process all the way back to the farm. I suppose I never really thought about it before, but I was very surprised by the variety of food available for chickens. This has been most interesting and informative. Renton – I was also surprised, after raising chickens for as long as I have, that I wasn’t aware of just how many items chickens will eat! It was fun to research this and share with everyone. Oh – and Bantams are a very fun smaller breed! Thanks for your comment.